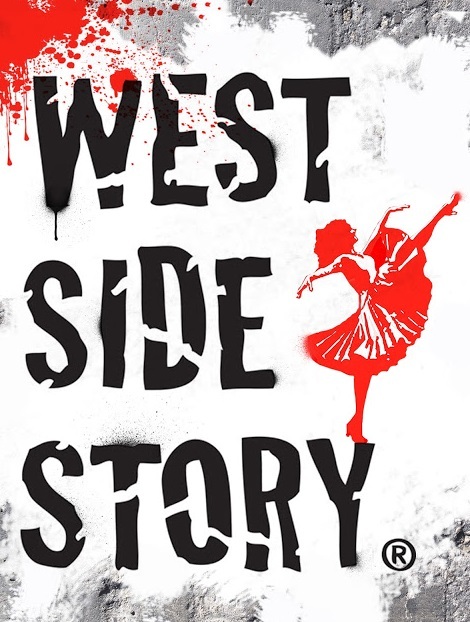 To begin its new 2018-19 season, Phoenix Theatre has chosen what many consider to be the greatest musical of them all, West Side Story, including yours truly. The show’s influence on American musical theatre culture is undisputed, and it began almost as soon as it opened in 1957 on Broadway. 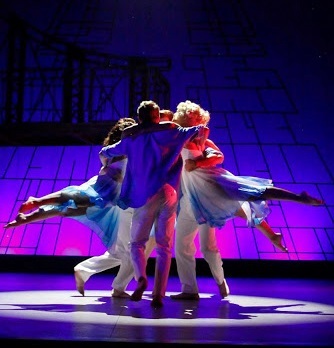 While Rodgers and Hammerstein had certainly tackled serious themes on previous productions, none were presented with quite the gritty, down-to-earth, present-day realism that director/choreographer Jerome Robbins envisioned. It was his idea to make a Romeo and Juliet update and to set it on the streets of Manhattan. Interestingly, the original concept was for the setting to take place on the city’s east side. But somehow it didn’t work, and the idea was shelved. Then writer Arthur Laurents saw a newspaper headline on the front page of The New York Times telling of Puerto Rican immigrant gang warfare, and things suddenly clicked into place. 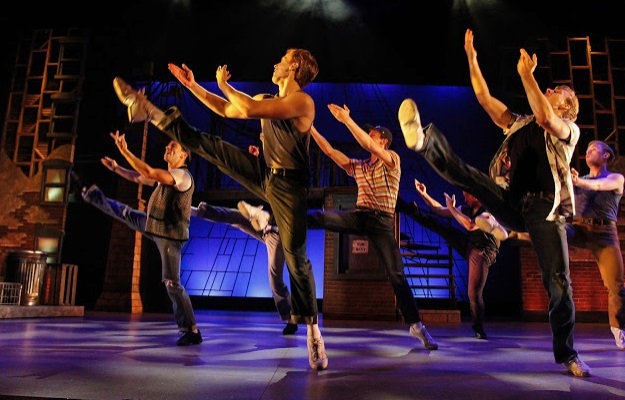 Created by a collaboration of established theatrical giants and one newcomer – choreographer Robbins, writer Laurents, musician Leonard Bernstein, and lyrics by a youthful Stephen Sondheim – West Side Story was immediately hailed as an American musical milestone. Ironically, when looking back on his work, Sondheim is quoted as saying that much of his writing and lyrical phrasing were the expressions of an inarticulate, excited young man who didn’t get it quite right. Perhaps it’s true that some of the clever lyrics in I Feel Pretty such as “An advanced state of shock,” or “It’s alarming, how charming I feel,” would not be said in character by recently arrived immigrants new to America and the English language, but who today would want to hear it any other way? That song, as well as all others sung by Puerto Rican characters, are now so ingrained in our American musical heritage, to change them would simply feel wrong. 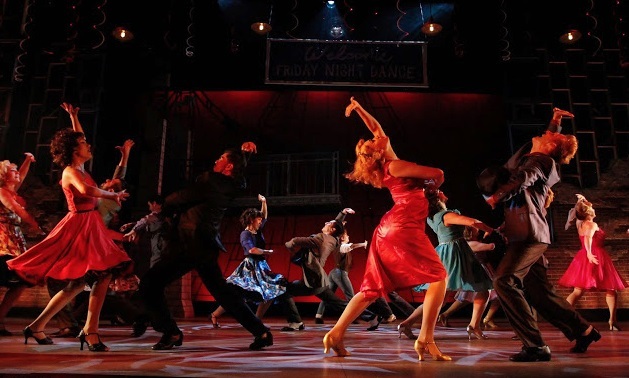 Performing now at Phoenix Theatre until October 14, under the experienced direction of Michael Barnard, who has repeatedly proven how to best stage a musical number, this new and undeniably vibrant valley production of West Side Story makes certain changes. Gone is the familiar sounding introductory whistle, the identifying clarion call of a New York west side street gang. Instead, the show dives headfirst into the finger-snapping rhythmic beats of the Jets and the Sharks as the excellent arrangements from the 13 member Phoenix Theatre orchestra under Alan Ruch’s musical direction fills the house. 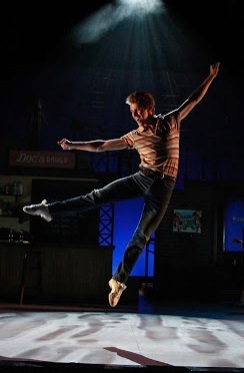 The accompanying theatre program credits Jerome Robbins for the original choreography, with additional work and guidance from Patti Colombo, and it’s these familiar leg kicking, arm stretching, muscular balletic moves, sharply executed by all members of the cast in both gangs, that brings the excitement of the Prologue alive. The whole five minute plus introduction, right up until a fight breaks out, interrupted by the abrupt arrival of Lieutenant Shrank (Hal Adams) and Officer Krupke (Tony Blosser), is so well delivered, it acts as a promise of things to come. One thing is made clear from the outset. In this West Side Story, these characters are aggressive. From the way gang leaders Riff (Cameron Edris) and Bernardo (Eddie Maldonado) talk not only to each other but to all gang members, including their girls, it’s as if they must wake up angry and maintain that level of anger throughout the day. And the way Riff and the guys order their girls around and forcibly usher them out of Doc’s Drug Store just before the boy’s war council, as portrayed here, you wonder why these women would ever want to remain with them. That level of aggression in dialog and action extends to the police. Admittedly, when Shrank orders Bernardo and the Sharks to go and stay out, there’s no disguising his prejudice and bigotry, but after the Puerto Ricans exit and the cop turns to Riff and the Jets, the character is supposed to talk in a calmer manner, one white local to another. At least, at first. He’s trying to appeal to them in a different tone than the one he used on the gang of newcomers. But like most of the dialog, it’s all delivered on a one-note level of in-your-face hostility. It lacks that certain subtle shade occasionally required in order for these teenagers and the authority figures to come across as genuine rather than ciphers programmed with one explosive emotion. Riff, for instance, has lived with Tony (James D. Gish) and his parents for more than four years; they’re best friends, but when Riff tries to convince his buddy to support him and all the Jets at the dance that night, instead of trying to appeal to Tony’s better nature, he sounds as though he’s making tension filled demands, the kind where every sentence could be punctuated with a finger stab to the chest. When they grapple, it’s supposed to be a little rough but playful. Here they look to be having a fight. The intention may be to up the energy and fill everything with fire and passion, but occasionally the tone could come down just a little, particularly between friends. 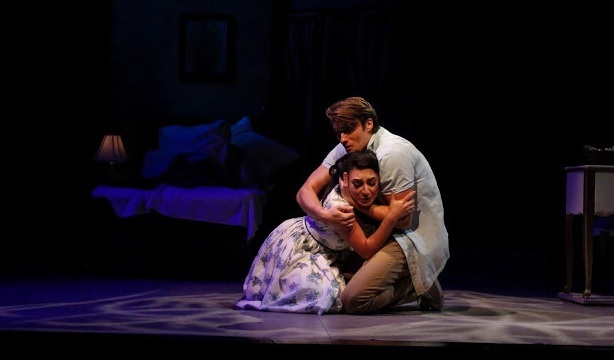 Instead, the subtlety required comes from the two star-crossed lovers, Maria (Joy Del Valle) and especially Tony, both delivering performances of natural emotional ups and down that thoroughly convince. From the moment this latter-day Romeo and Juliet meet, there’s no doubting the youngsters are anything less than completely lost in romantic love. On his way home from the dance, Tony’s whole demeanor brightens. You can see how he delights in the very sound of Maria’s name. Gish has such a fresh take on the character that when he sings, it’s as if you’re hearing Maria, a sixty-year-old song, for the first time. But that naturalism can also work against him. When Tony and Maria first meet at the Dance at the Gym, they exchange only ten short lines while looking into each other’s eyes. It’s a dreamlike, practically surreal moment; they’re hypnotized by each other, floating on air, existing in a world unseen by others; their words representative of conceptional thoughts rather than real dialog. But Gish delivers his lines in that natural, hesitant, boyish way of someone still in the real world rather than sounding hypnotically dazed. Perhaps that’s why after being asked by Tony if Maria is making a joke and she answers, “I have not yet learned how to joke that way,” a packed house on opening night laughed. It’s not and was never meant to be funny, yet the manner in which they interpret the moment and make ten poetic lines sound practically conversational, perhaps audiences new to West Side Story, having never seen that scene before, really would be amused by Maria’s innocent response. What audiences will ultimately come away with, however, is the spectacle of Robert Kovach’s hugely effective scenic designs of an abstract New York and director Barnard’s exciting musical staging. If there was ever an issue with Arthur Laurents’ original source material (and nothing to do with this Phoenix Theatre presentation) it was always the placement of certain songs. After the rumble that results with a double homicide, all humor is gone. It’s therefore difficult to believe that a frightened gang of youngsters dodging the law would suddenly take a break to sing a comical song. The film actually changed the order for that very reason, substituting Gee, Officer Krupke for the earlier Cool. And while purists would balk at the idea of a director re-shaping a theatre classic to reflect changes that made better sense in a popular movie, one alteration Barnard gets right is his new staging of America. 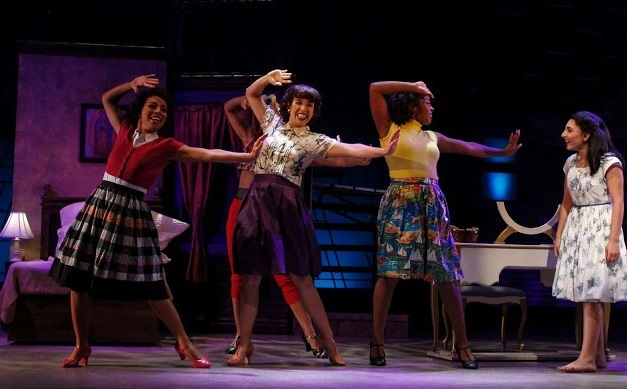 Jerome Robbins had always insisted that the song on the rooftop should be for the Puerto Rican girls only; the show’s only all-female number. But the movie expanded the production by adding Bernardo and the Sharks. Director Barnard has done the same here, enlarged the piece, not only giving the chance for the charismatic Alyssa Chiarello as Anita to shine – you cannot take your eyes off her – but filling the stage with extra bodies. Like the Prologue, The Dance at the Gym, the dream ballet sequence of Somewhere with an impressive lead vocal from Elyssa Nicole Blonder, plus the powerful “Tonight” Quintet, America will take your breath away. And like the show itself, it’s quite spectacular.